Most of us spend a lot of time in the kitchen, preparing meals and cleaning up. In many cases, we spend so much time in our familiar kitchen space that we don’t pay much attention to what it looks like. Short backsplashes. 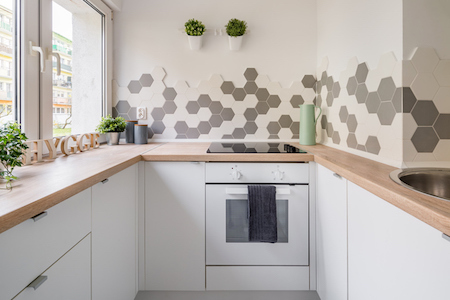 Backsplashes that reach up to six to eight inches above the countertop are sorely outdated. If you’re up for a remodel, take the backsplash all the way up to the upper cabinets to make your kitchen feel bigger and cleaner. Distressed wood cabinets. Once the darling of country-style kitchens, the clunky distressed wood of yesteryear is giving way to natural wood or white finishes. Over the stove microwaves. When microwaves came into fashion, homeowners put them over the stove to save counter space. But today’s families want necessities accessible for the entire family. Some are redesigning cabinets to move the microwave into an under-counter nook where smaller family members can reach it. Top-of-cabinet décor. Gone are the days of filling the space between the tops of your cabinets and the ceiling with dusty accessories like artificial flowers or greenery. Removing them from above the cabinets gives the room a more open feel. Hanging pots and pans. Once, every kitchen shown in a magazine had a big, beautiful, hanging rack filled with copper or stainless-steel pots and pans. Kitchen designers today are making room for them in drawers or cabinet, trading in that outdated country look for cleaner, minimalist lines. Anything but stainless steel. Over the years, kitchen appliances have gone from white to copper to avocado green and back again. But the desired look today is the cool, sleek look of stainless steel. Kitchen desks. At one point in time, every upscale kitchen featured desk space—a little nook where you could scan the mail, pay bills, etc. But those mess-collectors are now yesterday’s news. Moving desk chores to another room can give your kitchen extra space and alternative storage options.